Structural biology and collaboration are two strong and enduring aspects of research at the University of Wisconsin–Madison. In keeping with this tradition, the Department of Biochemistry has led a concerted cross-campus effort to bring cryo-electron microscopy (cryo-EM) to campus. Cryo-EM has recently advanced to a point that it can generate high-resolution structures of biological molecules by using electrons to generate images. Thus, cryo-EM is a burgeoning technology that can help UW–Madison researchers make significant new contributions to many areas of structural biology, including enzymology, virology, cell biology, and medicine. These discoveries will lead to a better understanding of many diseases and possible treatments. Last October, the 2017 Nobel Prize in Chemistry was awarded to Jacques Dubochet (University of Lausanne), Joachim Frank (Columbia University), and Richard Henderson (MRC Laboratory of Molecular Biology) for their development of the experimental and computational methods that underpin the remarkable versatility of this technology. A new research facility, yet to be named, will be housed in the Hector F. DeLuca Biochemical Sciences Complex, and its users will come from across campus and beyond. Researchers are planning to use state-of-the-art, powerful microscopes to study everything from whole cells to organelles and single enzymes. The Morgridge Institute for Research, Office of the Vice Chancellor for Research and Graduate Education (VCRGE), School of Medicine and Public Health, UW Carbone Cancer Center, and Departments of Biomolecular Chemistry and Neuroscience are key partners with the Department of Biochemistry in the effort to establish this multi-million-dollar facility. The facility is expected to open in 2019. Currently, the department is searching for faculty members who are leaders in cryo-EM research and would want to join the department’s efforts. Because of the breadth of applications of cryo-EM, this will inevitably draw the department into new areas, and at the same time, build on others. To jump-start the creation and operation of the facility, Landick led an effort to obtain a UW2020 grant from the VCRGE. Desirée Benefield, a Ph.D. scientist and expert in cryo-EM was hired shortly thereafter. She has already been playing an integral role in the facility’s success by providing guidance to the facility’s future users, such as training them in sample preparation, imaging, and analysis. Benefield studied biochemistry at the University of Tennessee-Chattanooga and completed her Ph.D. in microbiology at Vanderbilt University. There, she learned about cryo-EM and became enthralled with the technique. In 2014, she came to UW–Madison for postdoctoral training in the lab of virology professor Paul Ahlquist, who aims to use the new facility to visualize the structure associated with the replication of viruses responsible for Zika, MERS, SARS, Dengue Fever, and Chikungunya. and improvements in many other bioprocesses. 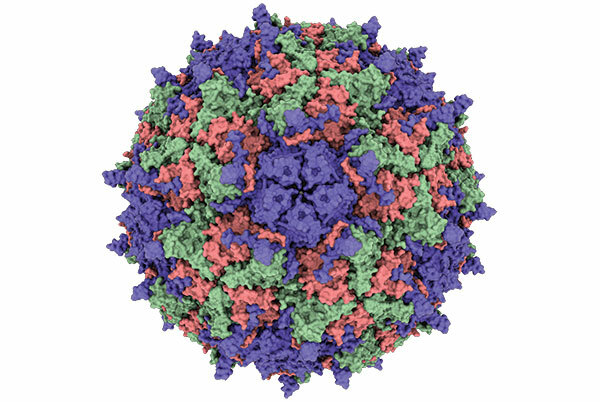 Cryo-EM can produce detailed structures needed to define the location, architecture, and dynamics of a wide array of biological molecules, such as cellular membranes, organelles, cell-cell contacts, and interactions of a virus with a host during infection. These images can transform our understanding of scientific challenges that span across all of biotechnology and biomedical research, including the molecular basis for diseases, and the discovery and development of drug treatments and other novel therapies. Rebecca S. Dillard and Elizabeth R. Wright of Emory University. At UW–Madison, faculty are exploring every corner of these areas — from biochemistry professors John Markley and David Pagliarini studying the mechanistic origins of mitochondrial disease to bacteriology professor Katrina Forest investigating the structure of tiny microbes often abundant in fresh water. Professor of botany and genetics Marisa Otegui studies the mechanisms plant cells use to regulate and traffic proteins to discern how they impact cell signaling and development. Cryo-EM helps her obtain useful 3-D images of organelles and the cell membrane to visualize these processes directly. Additionally, biomolecular chemistry professor Anjon Audhya investigates the mechanisms by which vesicular transport carriers are generated, which will facilitate a better understanding of how cellular homeostasis is maintained during development and disease progression. In virology, biochemistry and Institute for Molecular Virology professor Ann Palmenberg recently solved the structure of a virus responsible for asthma in small children. Up until now, she has collaborated with Purdue University because they have cryo-EM equipment, which UW–Madison will soon have. In other basic science areas, biochemistry professors are interested in DNA replication (Michael Cox and Jill Wildonger), RNA processing and control (Sam Butcher, Judith Kimble and Marv Wickens), the spliceosome (Butcher and Aaron Hoskins), transcription and gene regulation (Robert Landick and Aseem Ansari), motor proteins (Ivan Rayment), fusion of cellular membranes (Tom Martin), the structure of biological molecules involved in ion channels and transporters (Katherine Henzler-Wildman, Alessandro Senes and Michael Sussman), and many more. The cryo-EM facility at UW–Madison will allow them to see these profoundly important molecules, complexes and cellular machines in ways that previously were impossible. The facility will also foster collaborations on and off campus, as well as have an impact on teaching. Many of the faculty coming together to establish the facility are working to design coursework to teach undergraduates and graduate students about this new technology. Ann Palmenberg and research team.